Established in 2006, Pets Friends took over from an existing clinic and has developed into the friendly, hi-tech practice that is here today. The clinic includes a fully equipped consulting room, operating theatre and dedicated prep area with x-ray and ultrasound machines, blood testing equipment and other diagnostic and clinical equipment. Animals are cared for in warm and cosy surroundings with separate rehabilitation wards to ensure that dogs and cats can recuperate in peace and in a stress-free environment. A few years ago Pets Friends started a grooming service and we have subsequently re-fitted an area of the practice to accommodate a grooming salon. Owners are equally well-catered for in our waiting room, where they can relax and read a magazine or have a browse through our retail area. 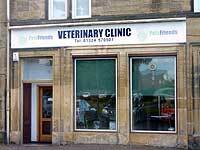 Pets Friends operates on an appointment only basis with surgeries between 9-10am and 2-3pm daily. We also have an appointment only surgery from 4.30pm till 6:30pm Monday to Friday. We are also open, appointments only, from 9-12am on Saturday morning. Pets Friends Veterinary Clinic can be contacted in an emergency outside of these hours by calling our out of hours veterinary care provider Vets ER on 07718 424688. Company number SC293581. VAT number 873 3495.